we've been calling him roach magee and this whole week we've been thinking of names and nothing feels right, today we finally have his official name: MOMO-CHAN (roach magee is his nickname). My little sister, Emily, has been begging for him for months. She pestered me even more these last few weeks and I caved. It's not that I didn't want him, I am just a planner and I NEED to do heavy research before I can take on such a responsibility. She's more- "let's go to the pet store and see." And although he technically wouldn't be mine (she bought him and his terrarium) I knew I would be doing half the work. So we did last Friday and saw this little guy. He was bouncing off the tank and on top of the other bearded dragons. You know something like love at first sight? Honestly his energy levels worried me but I just knew it had to be him and couldn't leave him behind. Before we made our final decision, the employee also showed us another we were interested in, he was so small and cute but as we reached to pet him he shied away. So we settled on our first choice and it could not have been a better match. 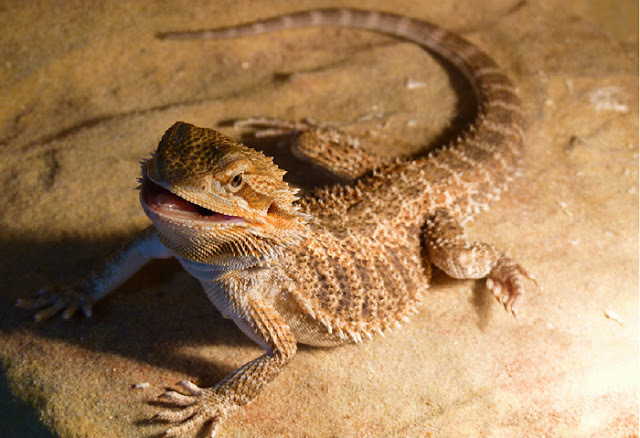 First a little on his species, he is a Bearded Dragon and is originally from the Australian desert. He will reach full size in about one and a half to two years. 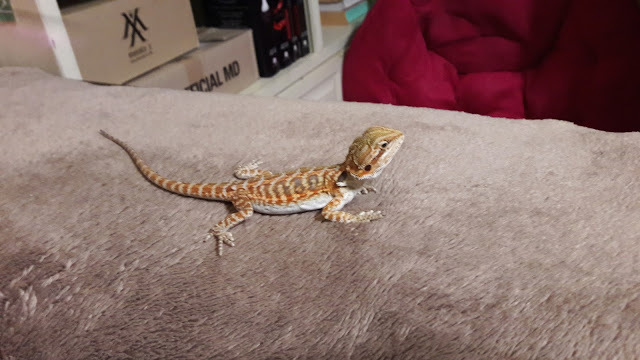 It isn't until I see photos of full grown beardies that it hits me that ours is truly a baby (judging by his size he is about two months old). a full grown beardie about the size of a forearm? I've gone through so many emotions and I am so in love with him. I don't know if it's just me, but I had this unconscious idea that reptiles are less sentient than they really are. 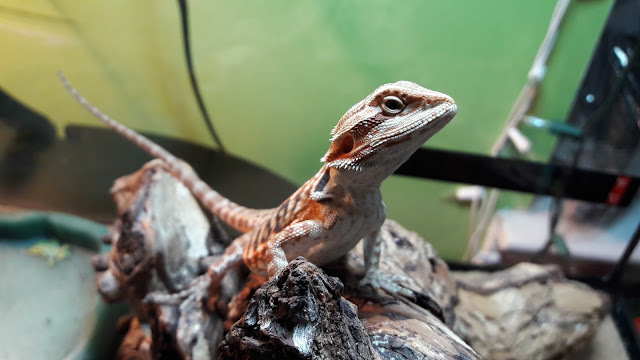 Our beardie definitely has his own personality. He personally doesn't mind being held and spending time with us. He has a sleep schedule and once he goes to sleep he really knocks out and won't wake unless the lights are too bright. We make him a little cave to make sure it's dark and he'll sleep next us while we use our phones or use the laptop. He was extra cute last night, I fed him close to his bedtime and he needs light to digest properly. I saw his sleepy eyes but said sorry because I wanted to make sure he digested his food. Several minutes later his scratching the front of the tank and I go pick him up and after turning off the lights he falls asleep on my hand. This was before my sister was getting out of work and when she was ready I decided to take him with me (2nd time), he was dead asleep so he just laid in my lap the whole round trip. And after he eats he likes to lay lazily on his branch. My sister and I have been having some wild dreams about losing him or putting him in danger (she even threw up in her dream when she thought he was dead). Especially when he is a baby or juvenile, live feed (roaches/crickets/worms) is a big part of their diet. This has made me paranoid as I am staring to see, hear, and feel things. I thoroughly examine my noodles for worms. I have long thick hair so it falls easily and if I feel it on my body I think twice. We have the fan on at night so a bag or paper will crinkle and all I think is- a cricket got away. (I JUST SIPPED SOME COKE AND FELT LIKE A LITTLE THICKNESS?? IN MY THROAT AND ALL I CAN THINK IS CRICKET). It's stressful trying to make sure he's thriving and has everything he needs. I don't know how I would cope full time with a baby 😂. He's currently in a 20 gallon tank (I regret telling my sister to hold off on the 40g) I also have been to multiple pet stores and can't find a proper background for his tank. He is on felt (don't think we'll use the sand that came with his tank, if we do it'll be when he's much older). As a baby, his diet should be 20% veggies and 80% protein. He gets his full of (small) crickets twice a day (as much as he can eat in 10-15min & dusted with calcium every other feed) & we leave him a salad as a snack/supplement for the whole day. When we first got him we tried pellets but he didn't take to them, we will try again later. He is pretty relaxed so we take him out for about half an hour at a time to relax with us, he'll go back in after he continuously tries to run away. 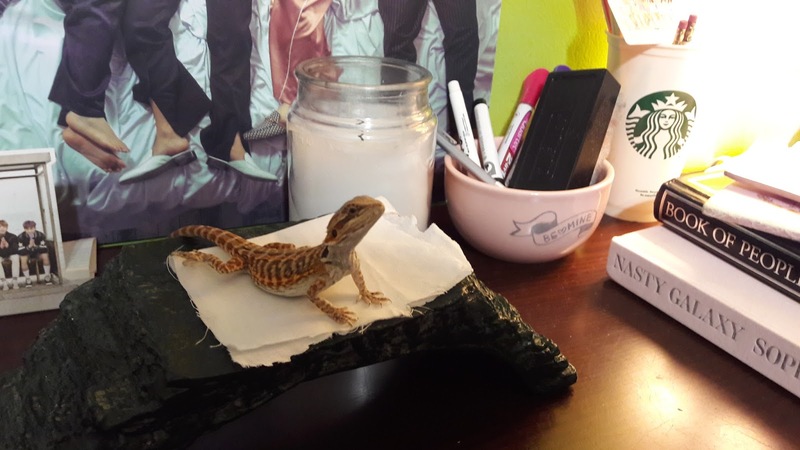 We try to give him a warm bath every other day for about 10 minutes, but I think we'll make it daily (especially because he's shedding to make sure he is hydrated!). I'm sure there's more but that's all I have for now. & obviously- please please please do your research before taking on a pet, especially an "exotic pet." There are some things I wish I would have looked into more (mostly relating to his tank), and although you'll learn a lot on the way some things can't wait or be overlooked. If anyone has any tips for me please let me know or comment.